Can you draw a face just using one line? I'm not sure about your family, but sometimes nighttimes with little kids can be pretty trying. Everyone is grumpy. Everyone is tired. Emotions tend to run high. Patience is worn thin. Well, we've had a couple of tough nights these past weeks. 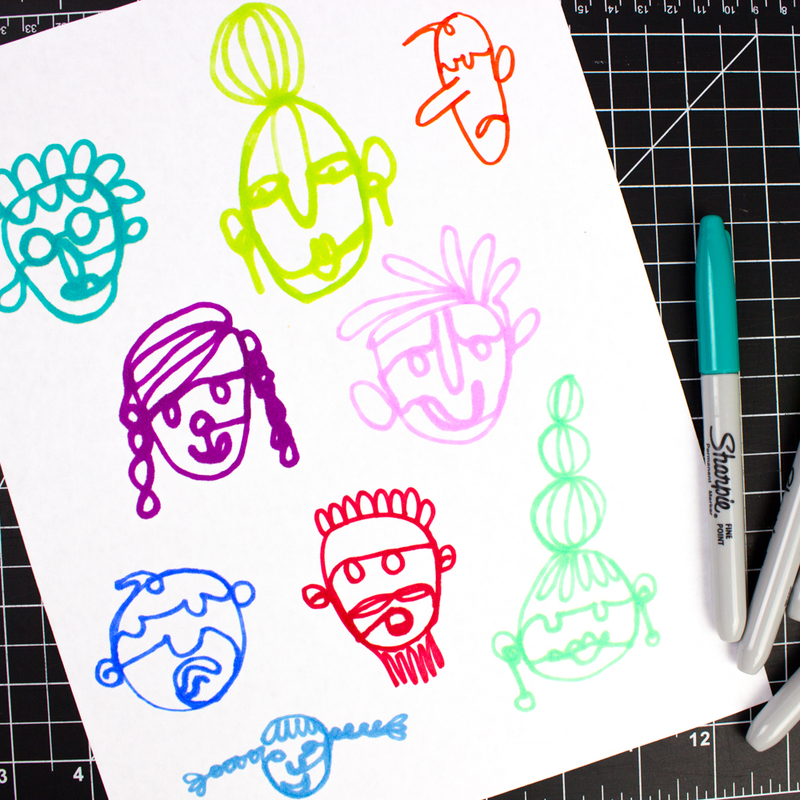 Recently I've found that simple drawing activities can put the kids (and me) in better moods. 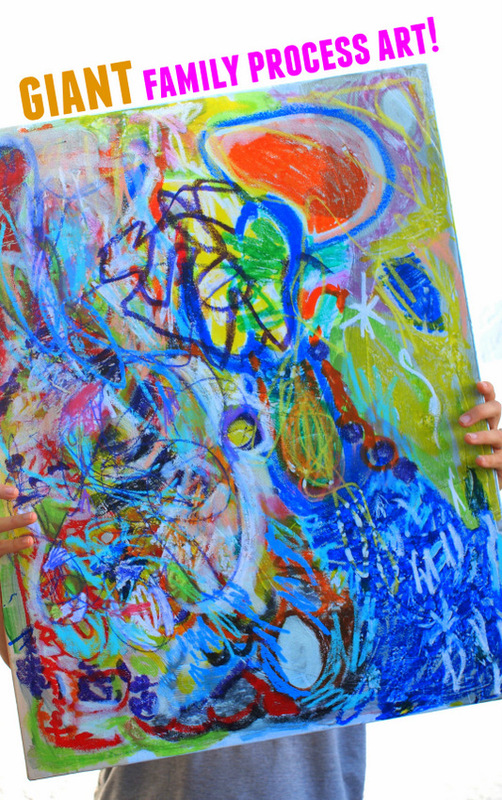 Here's one easy art activity that we recently tried and enjoyed. Can you draw a face using just one line? 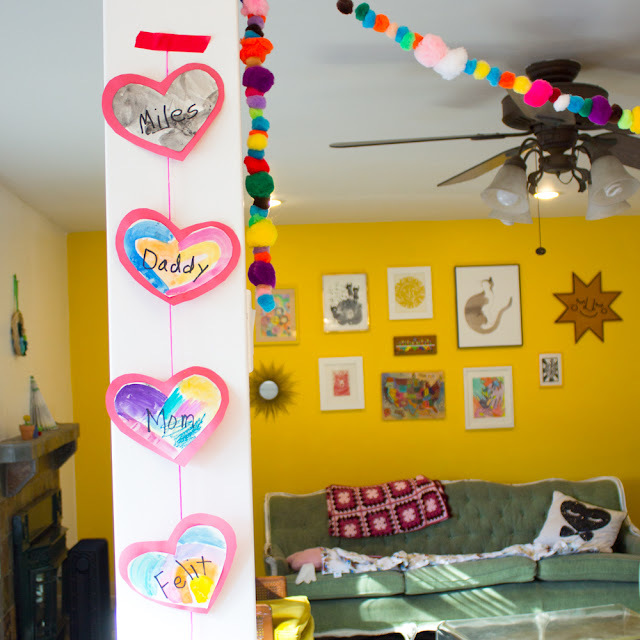 This super sweet watercolor heart banner is a great Valentine's Craft celebrating the entire family. During a recent playdate, I had the preschoolers make their own heart banners for their family. The children enjoyed painting, gluing, and identifying all the members in their family. Here's how we made this craft. 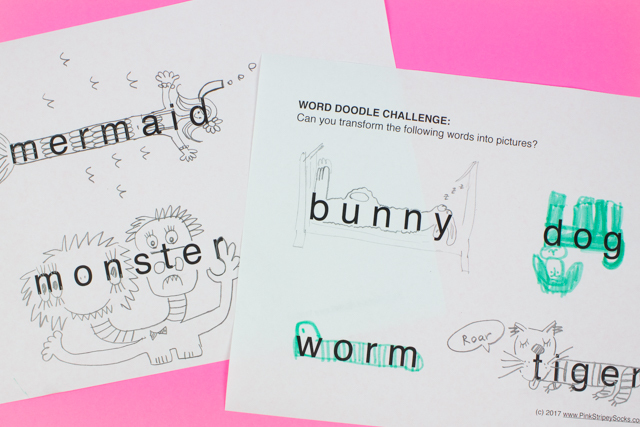 Word Doodle Art Challenge: Can you transform words into pictures? If you've been on my facebook page lately, you'll see that I really enjoy sharing videos of people doing creative things. (I love getting inspired!) Recently, I shared this super neat video of an artist transforming words like "unicorn," "cat," and "fish" into pictures. My son and I enjoyed watching that video so much that I made some more "word doodle sheets" for us to try out together! Fathers, stop reading this post and step out of the room! (Are they gone? Good!) Now that they've left, let's talk Father's Day Crafts. Is there a guy in your life who is a super dad? Um hmm.. Thought so. And would you and the kids like to make him an awesome gift? Yup. Thought so too. Well, you came to the right place. My son and I L-O-V-E super hero crafts and recently whipped up this super hero comic inspired frame to give my husband for Father's Day. Ever have one of THOSE weeks? Where life is chaotic, stressful, and messy? Where things don't go your way and you find yourself late at night picking apart all the things that went wrong? Well... we just had one of those weeks. (Ok... if I'm going to be honest... probably one of those months...) And I wish I could say that I was patient and loving and wise and kind and strong... but I wasn't. When life spirals out of control, I find myself doing two things- (1) taking naps and (2) doing easy art and craft activities. It's surprising how these two activities revive my spirits. So today I wanted to share this really easy art activity that my preschooler and I recently worked on together. Inspired by Meri Cherry, we made our own GIANT family process art. This post contains affiliate links. Thank you for your support! For my full disclosure, click here. Hello Summer! 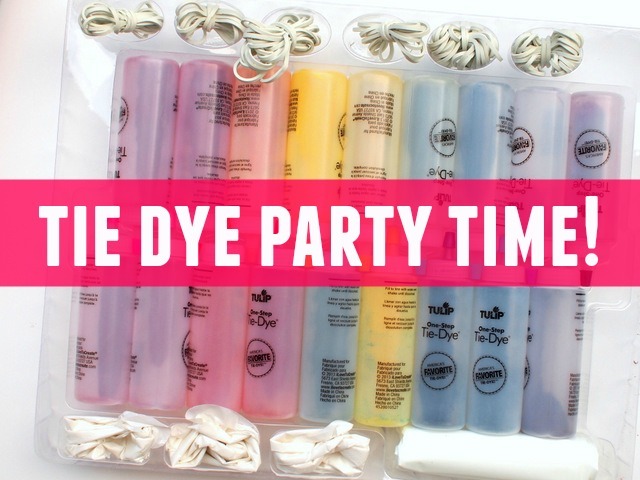 Let's have a Tie Dye Party! This post is sponsored by I Love To Create and Blueprint Social. However, all opinions are my own! Ah, summer, sweet summer. Nothing screams summer to me more than sunny weather, grill outs, fresh watermelon, and tie dye! I recently received a free box of tie dye curtesy of I Love to Create's Tie Dye Your Summer campaign... and I couldn't wait to try it out! This weekend my sister took me out to city to celebrate my birthday. We passed the time thrifting, eating, walking, and chatting. It was a really perfect day. I loved hanging out with my sister and I felt so inspired seeing all the colorful street art and lovely handmade items. To see more photos, keep on reading! Since we were away in Australia for a bit, Easter really snuck up on me this year. I felt like I didn't have time to prepare my heart for what it meant, and I didn't have time to prepare too many Easter crafts for the kids to do. Fortunately, the holiday still came and went with a lot of joy, fun, and crafting. This year we attended two Easter celebrations, one with a couple of good mommy friends, and the other with family. As a mommy (and a blogger), I always try to bring my camera whenever we attend get-togethers. I think those events are special and I want to capture all the beautiful memories, yummy food, and funny moments that inevitable occur. But lately, I've noticed that when I pull out the camera to snap photos, I also miss out on a bit of the moment's magic. Sure, I've captured a memory in photograph, but I also wasn't really a part of it (probably because I'm fiddling around with camera knobs... blech technology). Does that make sense? Does anyone feel that way too? Anyway, I guess this was a really long intro to just explain why this year's photos were kind of lacking... and why my shots were mostly of crafts. We loved celebrating Easter with friends and family this year.... and I was just having a bit too much fun beiing in the moment to stop and capture the moment. Yikes! I just realized that I hadn't posted any photos from our trip oversees. (Hubby's from Australia and we recently flew there to visit family.) Some of you were so keen on seeing them, so here are some highlights from our trip. We had a really jam packed schedule, so we were able to travel all over. First stop- The Beautiful Gold Coast! Pops takes Chuck to meet the ocean for the first time. His reaction^^ Yup. Apparently he isn't a big fan of the water and waves. Sand is much more his thing. Sharks are so cool... and super scary looking. Eeek. Hee hee... Chuck loved feeding his cousin hot dogs. Greetings from Australia! Sorry for the lack of posts this week. We're currently visiting family in Brisbane, so posting will be sporadic till we get back. Since I had a couple of free moments today, I thought I'd share these handmade gifts that Chuck and I made for this trip. Chuck currently enjoys painting, so we created some lovely pieces of contact paper stenciled artwork. We gave them as gifts and I think they're extra special because they were handmade by Chuck. Keep reading to see how we made them! Warning! This post contains a lot of photos! But, I figure it's ok since Christmas only happens once a year. Awhile back, hubby, Chuck, and I had lunch with friends at Eately, an Italian marketplace in the city. We loved the food so much that we went again this weekend with another friend. Oy vey! Oh New York, I love you dearly, but I really don't like your crowds. Eately's shops and restaurants were jam packed with rows and rows of people. Poor hubby struggled to maneuver our stroller through it all. But despite being pushed around, I'm really glad we made the trek across the river. We saw shops lined with rows and rows of yummy goodies and we got to hang out with a dear friend. Oh yeah, and let's not forget about the food. Oh boy, it was just as good I remembered. In fact, I'm drooling now just thinking about our pasta dishes. Yum yum. How was your Halloween? Ours was pretty jam packed. We entertained some out-of-town guests, carved pumpkins, attended a couple of kids' parties, and went trick-or-treating. I was loving most of it until the very end. I was definitely burned out by the last Halloween party. Phew. Too much candy and partying for this mama. In addition to trick-or-treating, we attended two Halloween parties at the library. It was uber-cute seeing dozens of toddlers dressed up in costumes. I also couldn't help but ooh and ahh over the cute treats that some moms made. Check out these marshmallow monsters. Too. Darn. Adorable. And finally, our trip to Lancaster was made fully complete with a visit to the nearby Pennsylvania Renaissance Faire. That's right... I finally got a chance to wear my flower crown! This little guy was locked up in pirate's prison. The crime? Being too darn cute. We just got back yesterday from our trip to visit hubby in Pennsylvania. He's been down there for work so we thought we'd hang out with him and enjoy the scenery. Lancaster's Central Market was hustling, bustling, and full of yummy foods! Chuck loved riding the "choo choo" wagon ride! Day at the farm from Pink Stripey Socks on Vimeo. I had to stop and admire the beautiful view. It's so different from the one at home. We ended the night by warming ourselves around the bonfire. It felt like a perfect Fall day. Yay! It's finally Friday. I've been counting down the days to the weekend since Monday. Hooray! We made it. The week really crawled by and honestly, by Wednesday I was ready to throw in the towel. (Do you ever feel like this too? Too bad we can't just build ourselves a time machine and fast forward to Fridays and cool holidays.) Thank God we made it. Now it's finally Friday we're going to visit hubby in Pennsylvania. I'm really looking forward to seeing him and hanging out together as a family. Cross your fingers that the weather stays sunny for us, ok? I loved seeing this little cutie utterly enchanted by a puffy yellow yarn ball. That's it! I hope you have a wonderfully relaxing and refreshing weekend friends. See you next week!